The representative of Iran, in exercise of the right of reply, said that this morning, the Kuwaiti Prime Minister had referred in his statement to the three Iranian islands located in the Persian Gulf. The Iranian Government reiterated its full sovereignty over the Iranian islands of Abu Musa, Greater Tunb and Lesser Tunb in the Persian Gulf and rejected categorically any claim to the contrary. The measures undertaken in those islands by the Iranian officials had been always conducted based on the principles of the sovereignty and territorial integrity of Iran. Iran, he continued, had always pursued a policy of friendship and good-neighbourliness with all its neighbours. In that context, Iran stood ready to discuss the matter bilaterally with relevant officials in the United Arab Emirates, with a view to strengthen the relations in various fields and accordingly resolve any possible misunderstanding by the other party. The territorial integrity and the sovereignty of Iran over the islands was not negotiable. Moreover, he said, in relation to the reference made in the statements of a few delegations, Iran wished to stress that the only correct historically and universally recognized name for the sea between Iran and the Arabian Peninsula was “the Persian Gulf”. Therefore, any use of fabricated or incomplete names for that body of water was totally groundless, absolutely unacceptable and of no legal, geographical or political value. The representative of Iran, speaking in exercise of the right of reply, said he was replying to “a series of baseless allegations against my country” by the Prime Minister of the “notorious Israeli regime”. Iran categorically rejected those allegations, in particular those relating to its nuclear programme, “which is exclusively peaceful and in full conformity with our international obligations and in exercising our inalienable right to use nuclear science and technology for peaceful purposes”. As a country with no record of aggression in its centuries-long history, Iran was a party to all major international instruments banning the production and use of Weapons of Mass Destruction, he said, citing the Treaty on the Non-Proliferation of Nuclear Weapons (NPT), the Convention on the Prohibition of the Development, Production, Stockpiling and Use of Chemical Weapons and of Their Destruction (Chemical Weapons Convention) and the Convention on the Prohibition of the Development and Stockpiling of Bacteriological (Biological) and Toxic Weapons and on Their Destruction (Biological Weapons Convention). It was fully committed to all relevant legal obligations under those treaties, and was proud to have proposed a nuclear-weapon-free zone in the Middle East. The representative of Iran said the islands of Abu Musa, Greater Tunb and Lesser Tunb were an integral part of his country’s territory and rejected any claim to them. 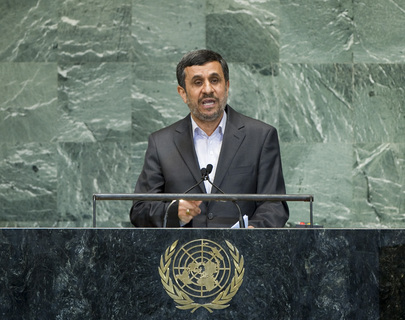 Measures taken on those islands were based on Iran’s sovereign rights and territorial integrity, he added. Stressing the importance of good-neighbourly relations between his country and its Persian Gulf neighbours, he said negotiations between Iran and the United Arab Emirates would expand their relations in various fields and help remove misunderstandings relating to the documents exchanged in 1971 on the territorial issue. He went on to emphasize that the “Persian Gulf” was the only historically correct name for the waterway between Iran and the Arabian Peninsula, and any fabricated name, including that used by the United Arab Emirates, was unacceptable, with no legal or political value. The representative of Iran responded by saying that the islands had been part of Iranian territory throughout history. The Government of Iran stood ready to discuss the issue bilaterally so as to remove any misunderstandings that might arise over 1971 Treaty, he added. The representative of Iran, also speaking in exercise of the right of reply, said that a Western delegation speaking today had been among several speakers making negative statements about his country’s nuclear programme throughout the debate. Like other NPT States parties, Iran had an inalienable right to research and produce useful energy for peaceful purposes without discrimination, he emphasized, adding that his country’s commitment to non-proliferation remained intact. Indeed, Iran cooperated with IAEA, and all its nuclear plants, were under 24-hour surveillance by that Agency, he said, pointing out that its latest report made clear that Iran’s activities were in line with its Safeguards Agreements. What was also clear, he continued, was that Iran was facing politically motivated attacks by those States — many of them nuclear Powers or those under their “umbrella” — that were trying to cover up their own “abysmal records” in the area. Rather than making statements about Iran, those countries should be concerned by the deadly threat posed by the Zionist regime which possessed nuclear weapons, he said. Indeed, that regime was the only threat to international peace and security as it tried to “red-line” the nuclear activities of others while itself crossing all such lines. It must submit to IAEA regulations and comply fully with its international obligations, he said. While Iran stood ready to engage in serious negotiations, it would never compromise on its inalienable right to peaceful uses of science and technology.